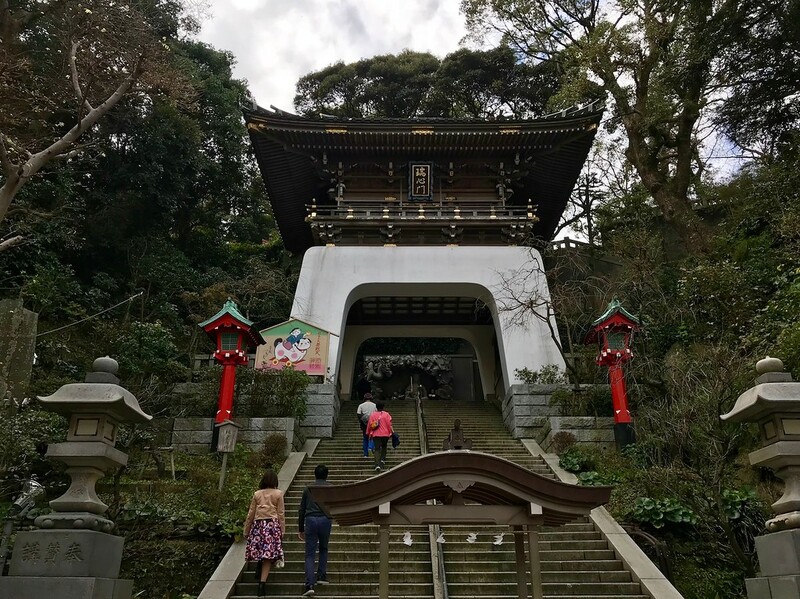 With a shrine, garden, and caves, Enoshima Island is a great place to soak up some sun, sea, and sky. 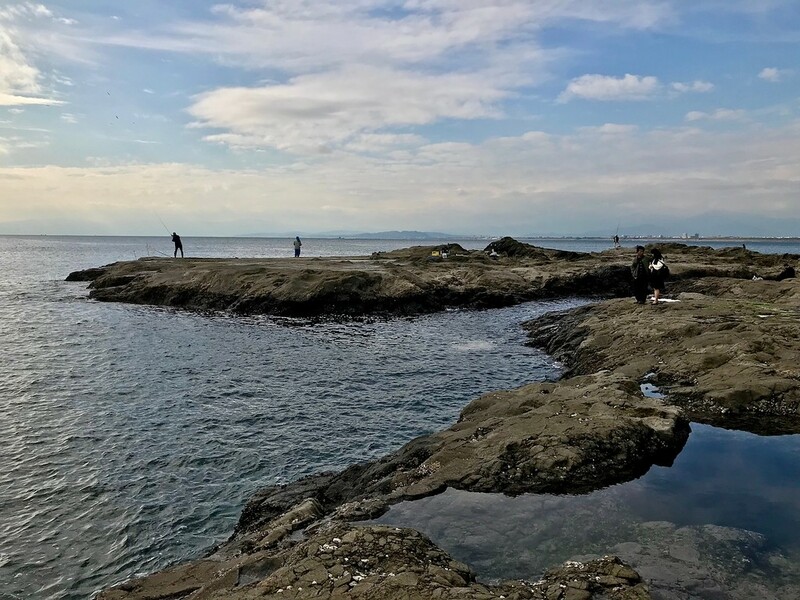 Use our Enoshima Island Day Trip Itinerary to make the most of your time there. 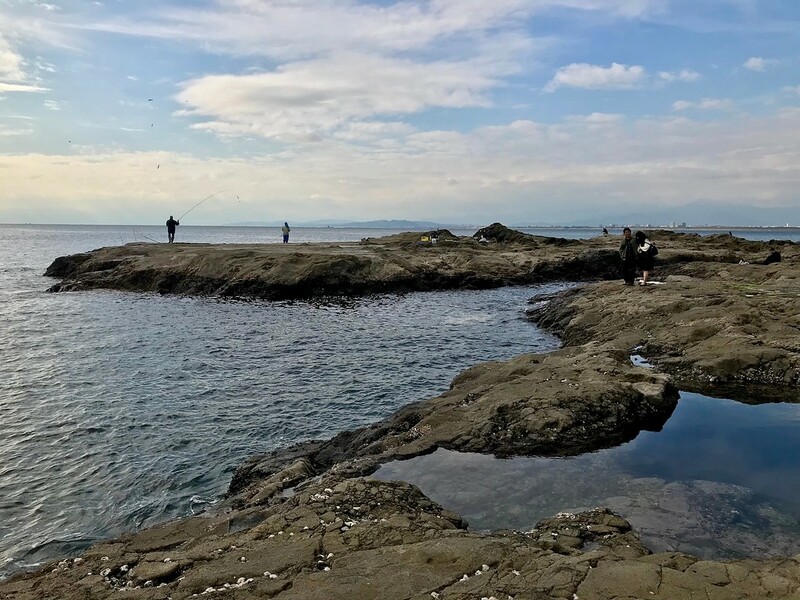 Enoshima Island is an island located a short distance west of Kamakura (meaning, it’s day trip distance from Tokyo). It’s small, well-kept, and touristy - but not unpleasantly so. 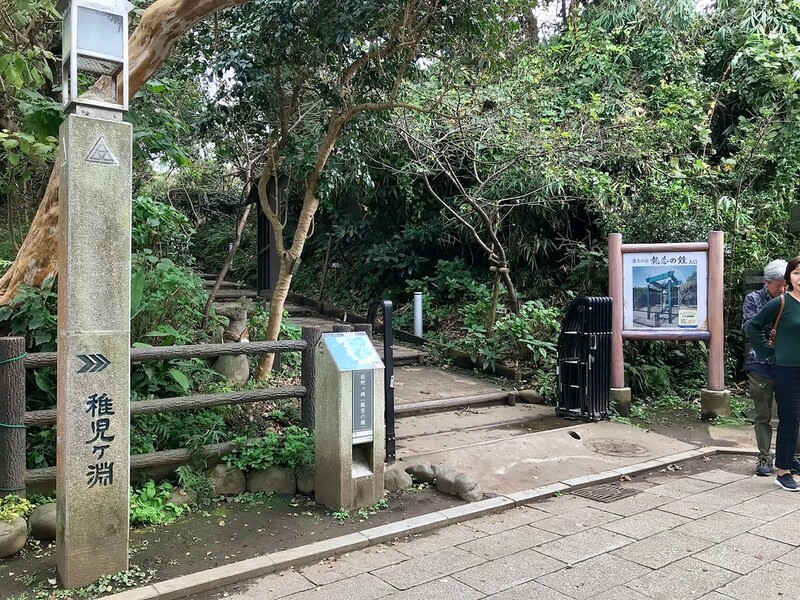 With a shrine, garden, and caves, it’s a great place to soak up some sun, sea, and sky away from the urban jungle of Tokyo. On clear days you might even be able to see Mt. Fuji from the island. 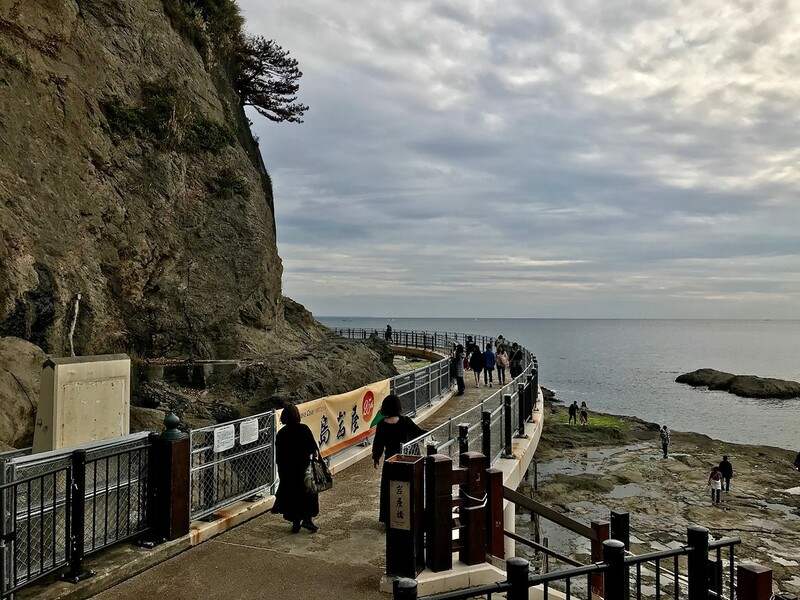 Make the most of a day out at Enoshima with this itinerary. 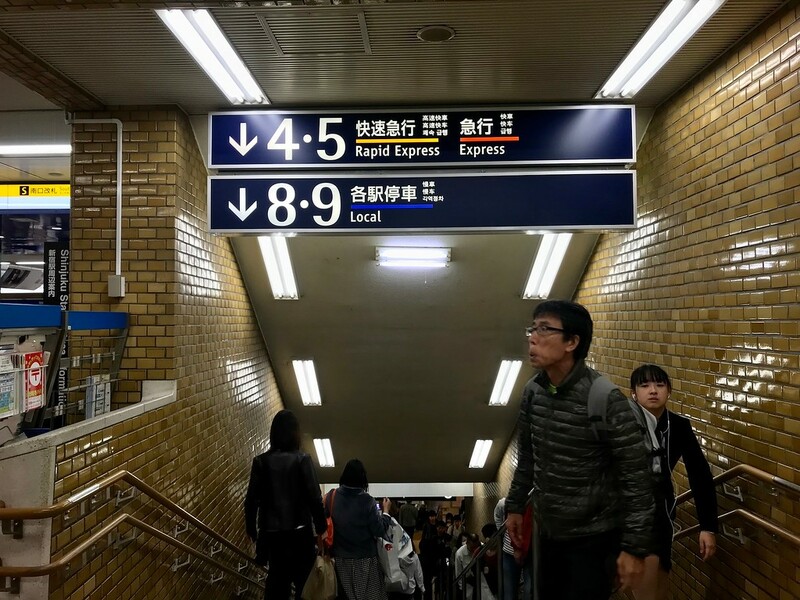 A one-way journey from Shinjuku Station costs JPY630 one way. 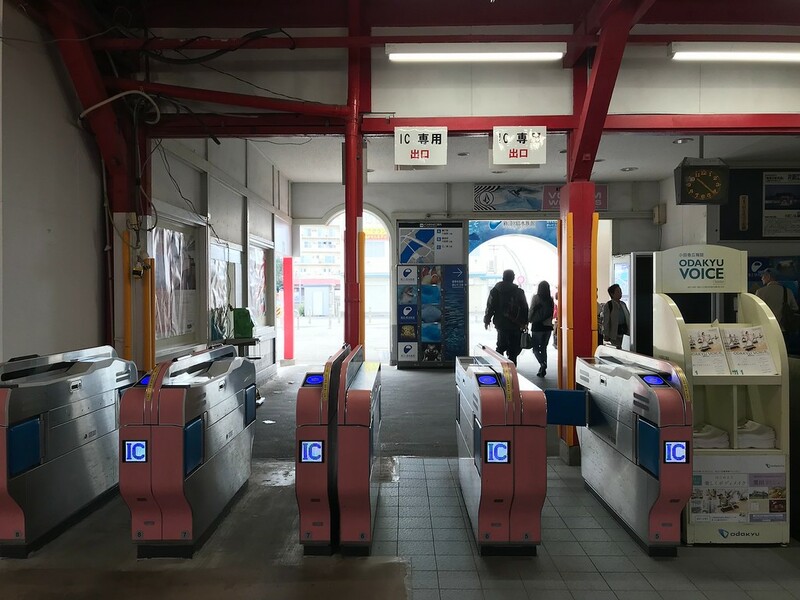 Use an IC card or purchase tickets from the machines outside the Odakyu station barriers. The journey takes about 1 hour 15 minutes. We suggest aiming to arrive by around 10:00am. This will give you ample time to explore at a leisurely pace. Itinerary timings are approximate. Adjust them to suit your schedule. This itinerary is a guideline. 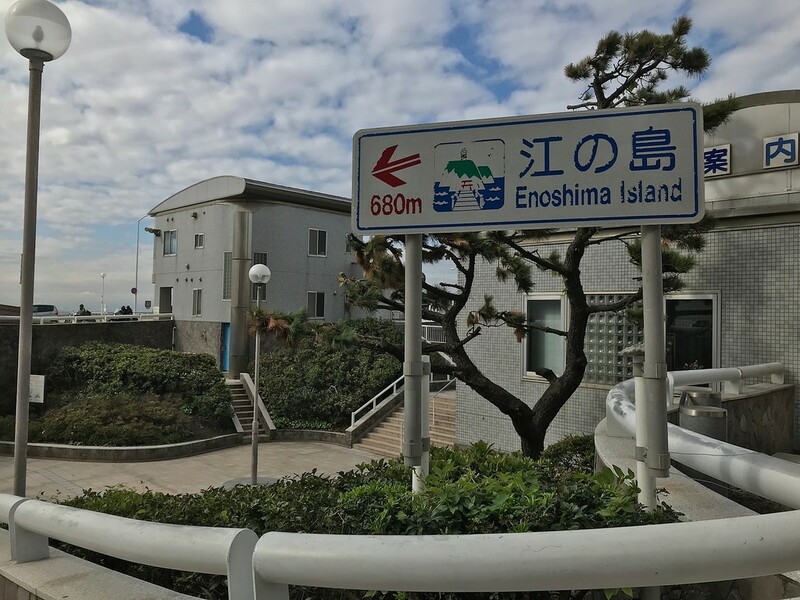 Enoshima Island is not very big, so depending on your walking pace, you may finish sooner rather than later. Since you're by the sea, and the ocean views are fantastic, it's a good idea to take things at a slow and unhurried pace. This is a walking itinerary. 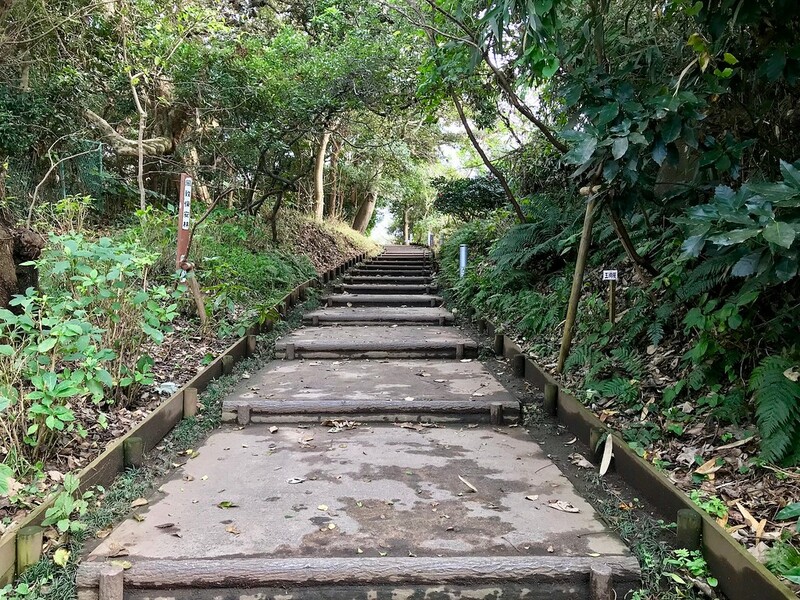 Exploring Enoshima Island involves climbing up and down quite a few staircases, so ideally you'll have your most comfortable shoes on for today. Take it slow and give yourself plenty of time for the staircases. You can reduce the amount of walking a little by taking the paid escalators up to the garden area. There are no downhill escalators, however. To explore the rest of the island beyond this, you'll need to continue walking up and down stairs. Start at any Odakyu gate at Shinjuku Station. There are several entrances. 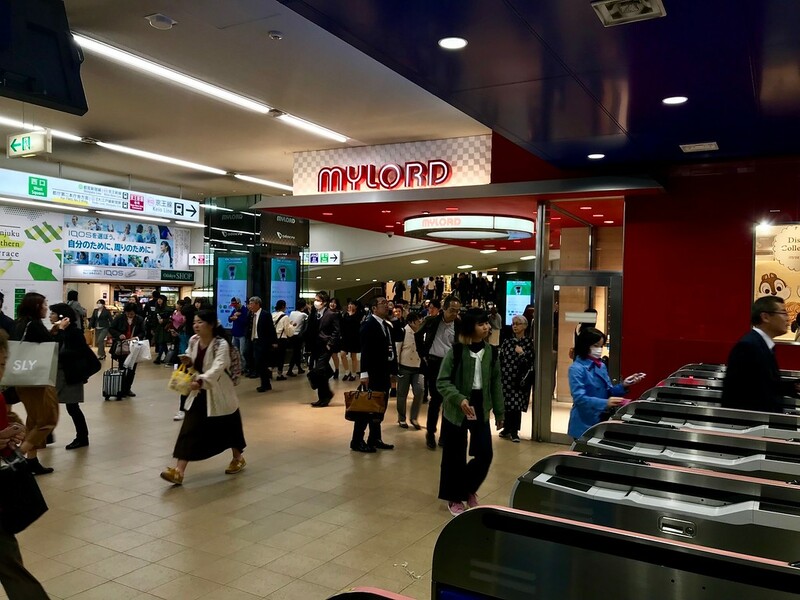 We've taken the South Entrance of the Odakyu Line in this case, located near the South Exit of JR Shinjuku Station. 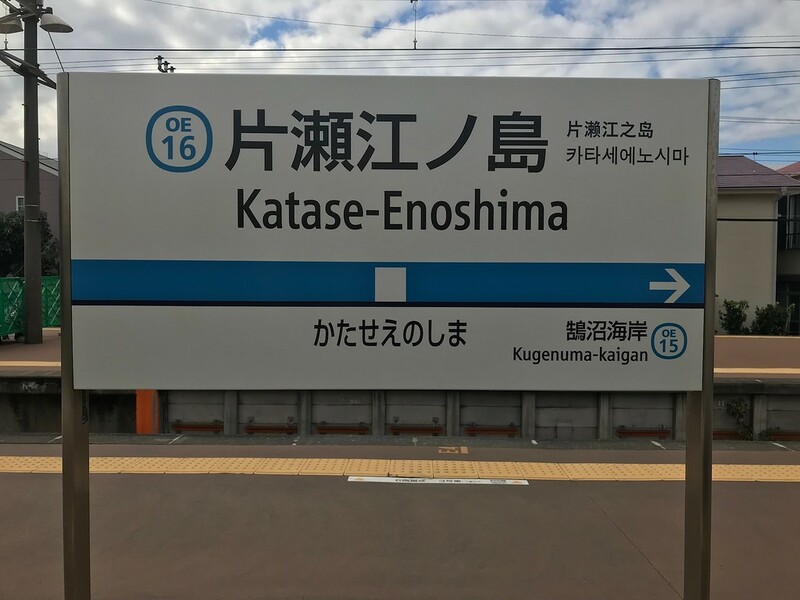 The nearest station to Enoshima Island is Katase-Enoshima Station on the Odakyu line. 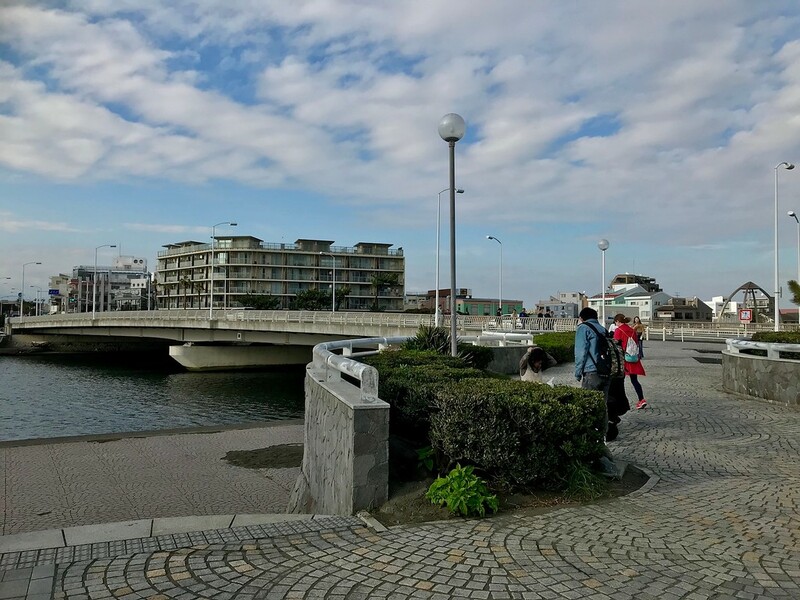 There's no direct train to Katase-Enoshima Station on weekdays, so you'll need to take the Express or Rapid Express train to Fujisawa Station, and change to a local train bound for Katase-Enoshima Station. You'll need to follow the signs to Platforms 4 and 5. Rapid or Rapid Express trains depart from these platforms - these trains stop only at the major hubs, skipping over many other stations. 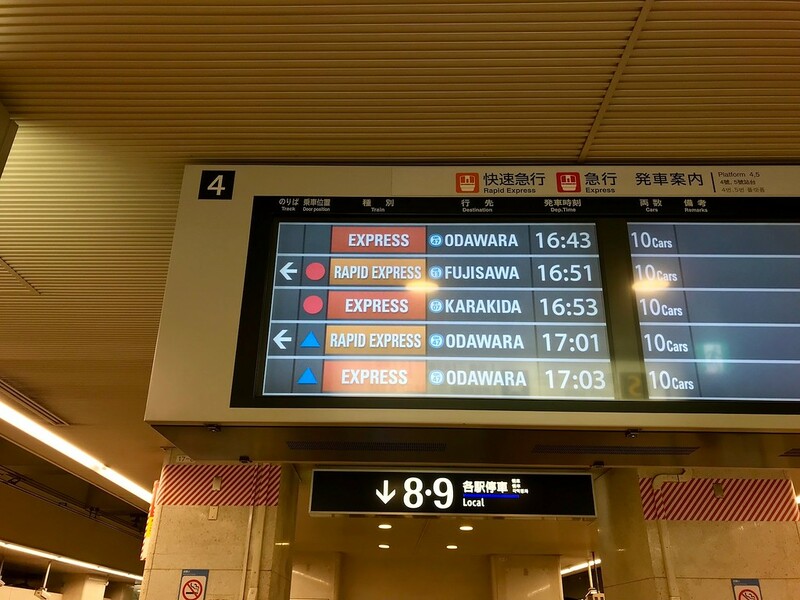 Look for a red ‘Rapid' sign or orange ‘Rapid Express’ sign bound for Fujisawa Station. The journey will take approximately one hour. Alight at Fujisawa Station. 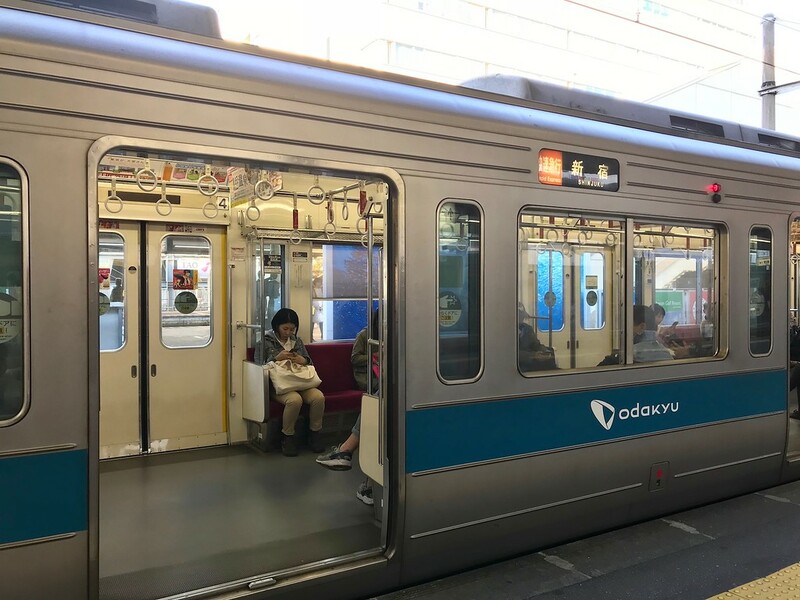 The train on the opposite platform will usually be the local train bound for Katase-Enoshima Station - you can see it written on the train carriage. Katase-Enoshima Station is 3 stops down from Fujisawa Station. You've reached the final stop. Alight and head for the station's sole exit. If you need to store any excess luggage, there are lockers at the station. There aren't many lockers, though, and they tend to fill up quickly during busier seasons. Cross the road and, subsequently, the bridge. When you see First Kitchen on your left, turn right and down into the underpass. 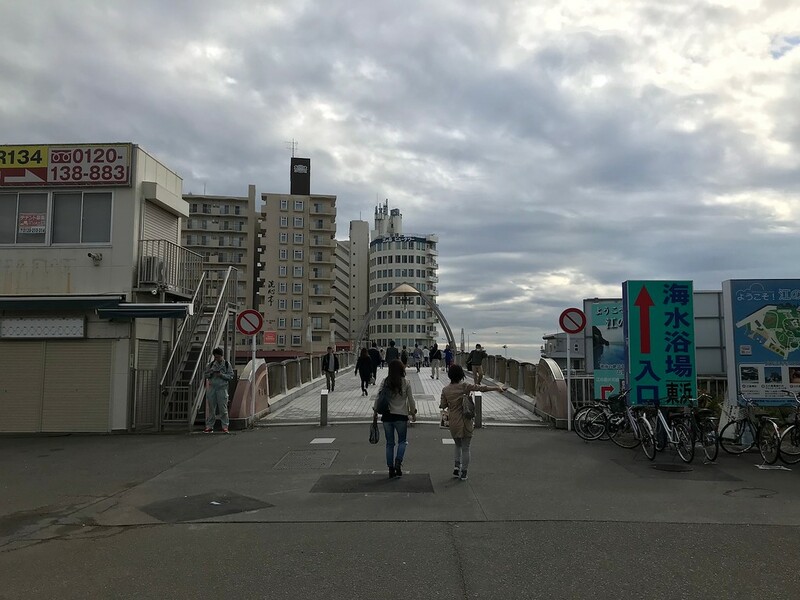 This is the road leading to Enoshima Island. From here, it's about a 10-minute walk to the island. Welcome to Enoshima Island! 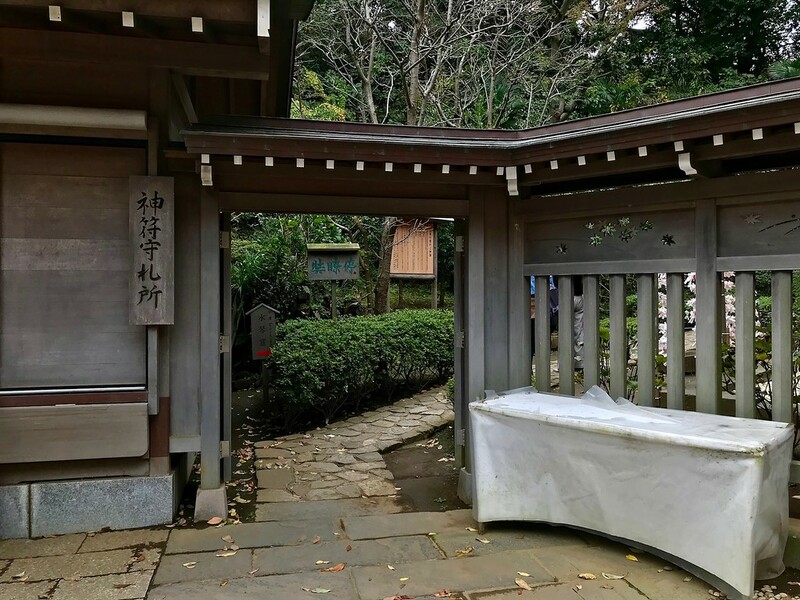 Your first order of the day is to visit Enoshima Shrine. But first, you’ll have to make it past the tourist shops selling octopus rice crackers, soft-serve ice creams, and all manner of touristy tchotchkes. Luckily, if you’re there early on a weekday, the shops won’t be open yet, and there’ll be fewer people visiting. Start climbing. 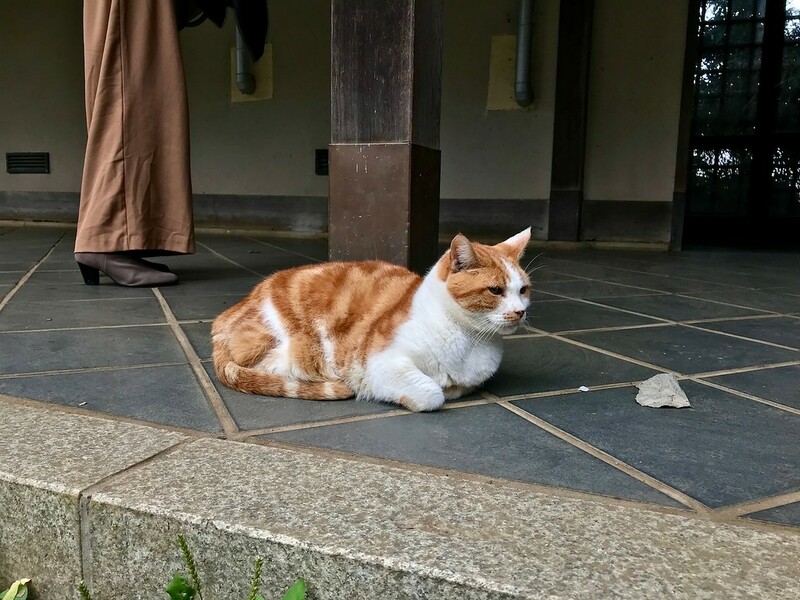 Incidentally, one of Enoshima's claims to fame is its resident fat cats. They're usually quite docile and aren't adverse to being stroked. Don’t forget to look down. 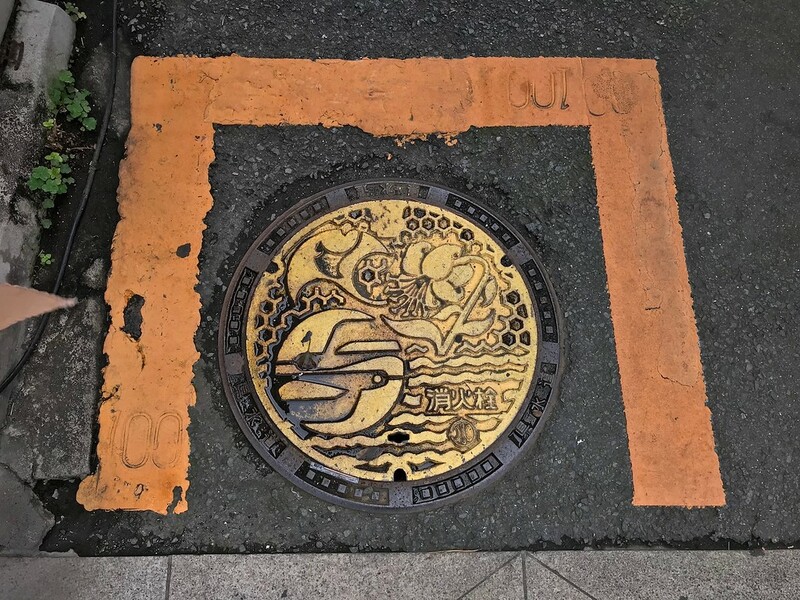 Enoshima has some very pretty manholes. 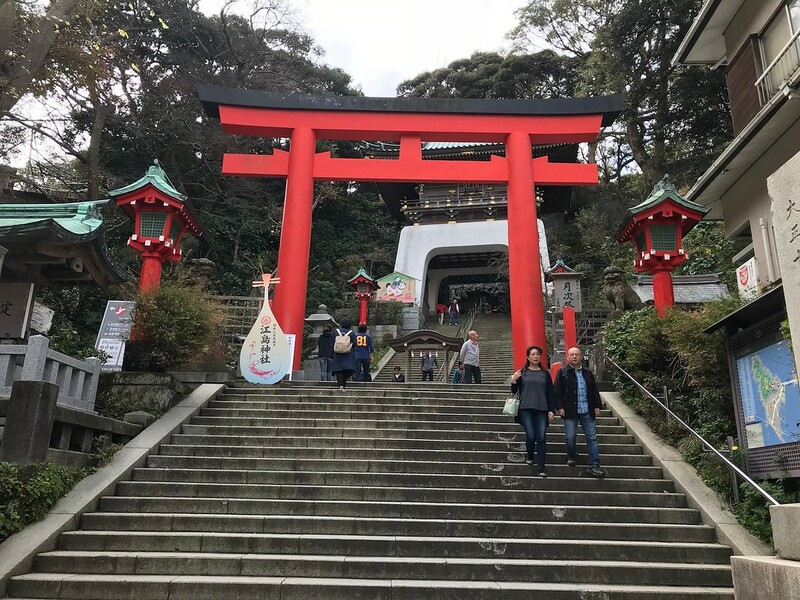 Enoshima Shrine has three parts to it: the Outer Shrine (Hetsunomiya), the Middle Shrine (Nakatsunomiya), and the Inner Shrine (Okutsunomiya), spread out across the island. It’s not a proper shrine pilgrimage if you don’t sweat a little making the journey there! 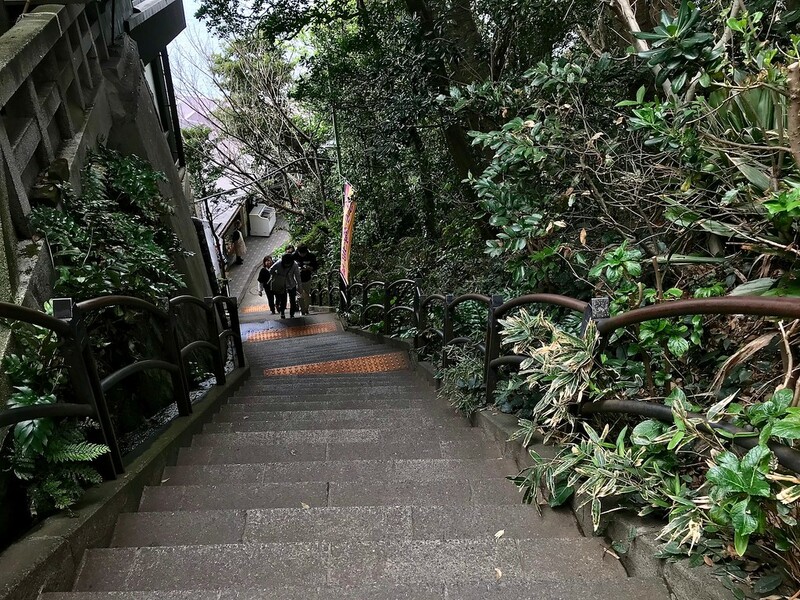 As you come up from the shopping street, you’ll see the first set of stairs. If you prefer to skip some of the uphill climb, you can turn left before the first set of stairs, which will lead you to a paid escalator. 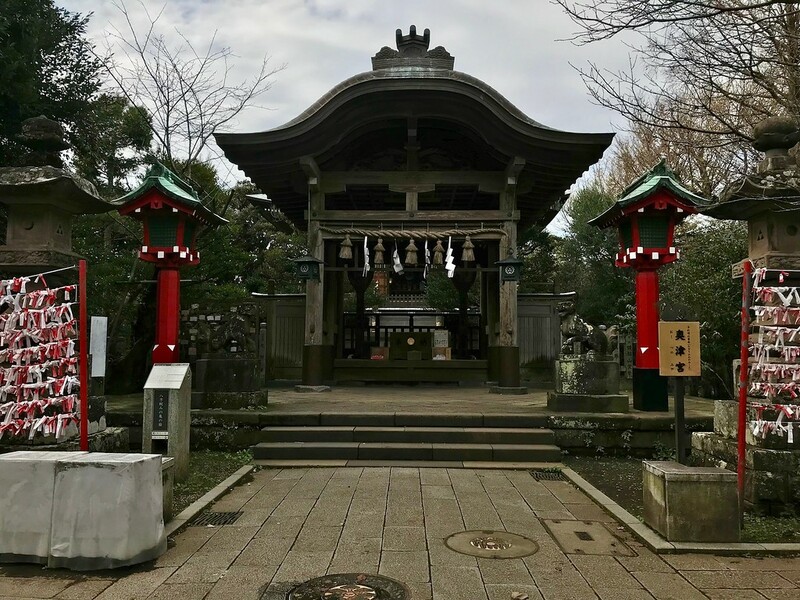 It costs JPY180 to go up to the Middle Shrine. It'll only take a few minutes, if that, to reach the Outer Shrine area. Give yourself a little time to explore and look around. 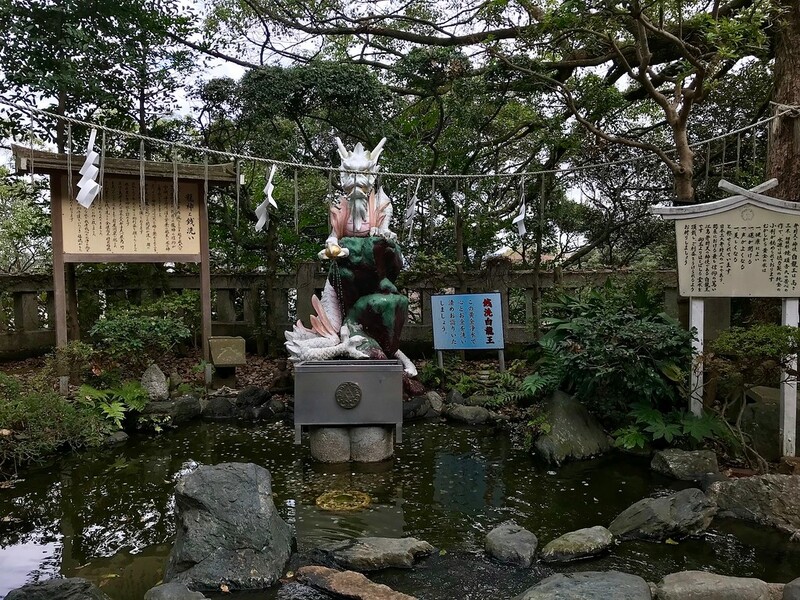 There's a small hall with a few Benzaiten statues, which costs an additional JPY200 to enter. 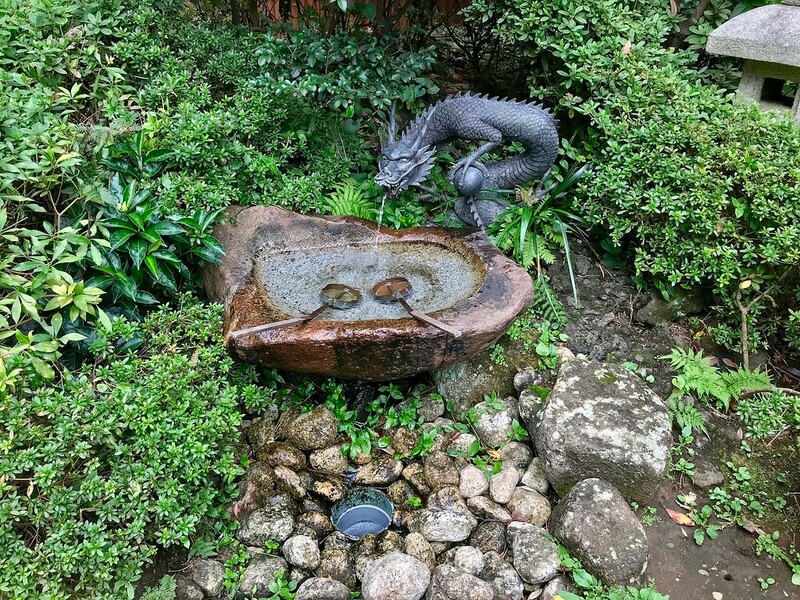 Don't forget to check out the small pond with a dragon statue in the middle of it. 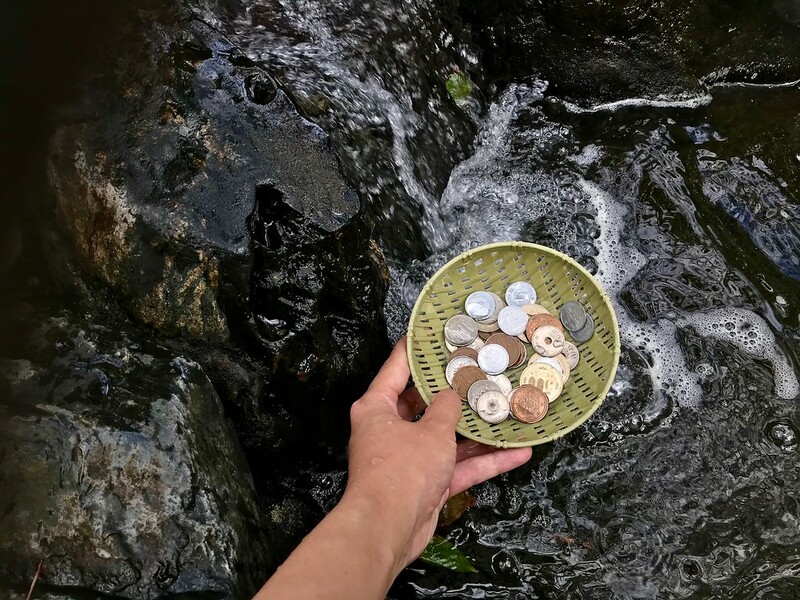 If you wash some money in the spring waters, your fortune might just multiply. Small baskets are provided for this purpose. 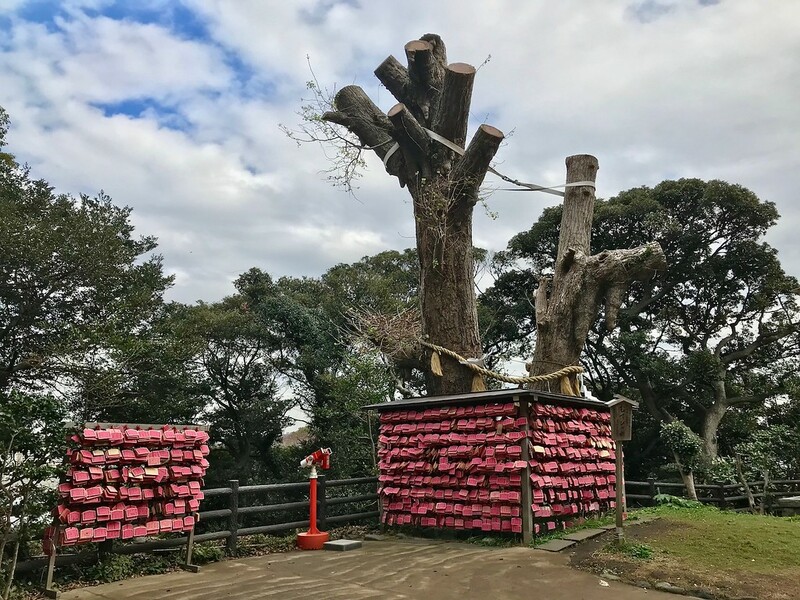 You'll also pass by a tree covered in wooden votive boards. These are specifically for luck in love. The path only leads one way, punctuated by stairs. Keep following it. You'll encounter a few observation decks on the way. The Middle Shrine area is pretty quiet and understated. Say a quick prayer. ...that leads to this little stone basin. Stand on the stone in front of it and pour some water into the center of the pipe opening below, and you'll hear a musical tinkling emanating from it. Keep following the path in an upwards direction. 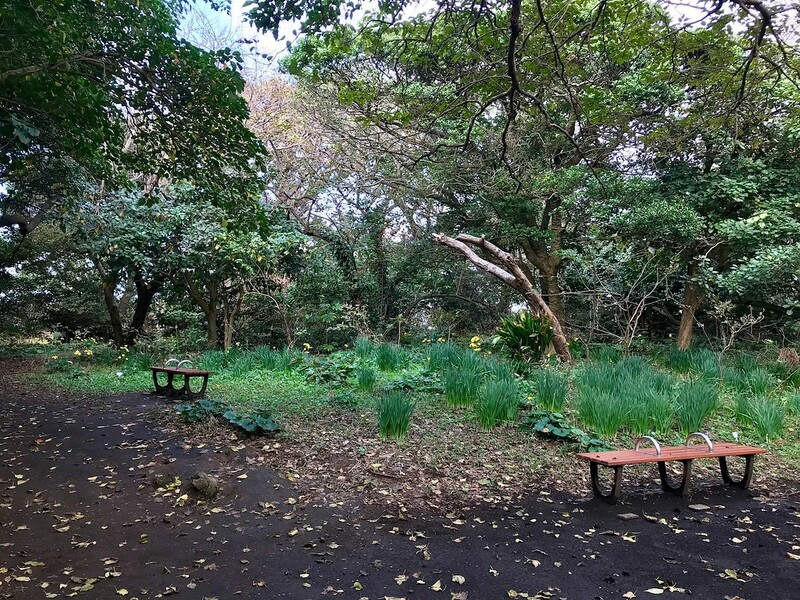 After a few minutes, you'll encounter an open space with a cafe and lookout points on Kamegaoka Plaza to the left,, a path leading straight to the other side of the island, and the Samuel Cocking Garden ahead to the right. 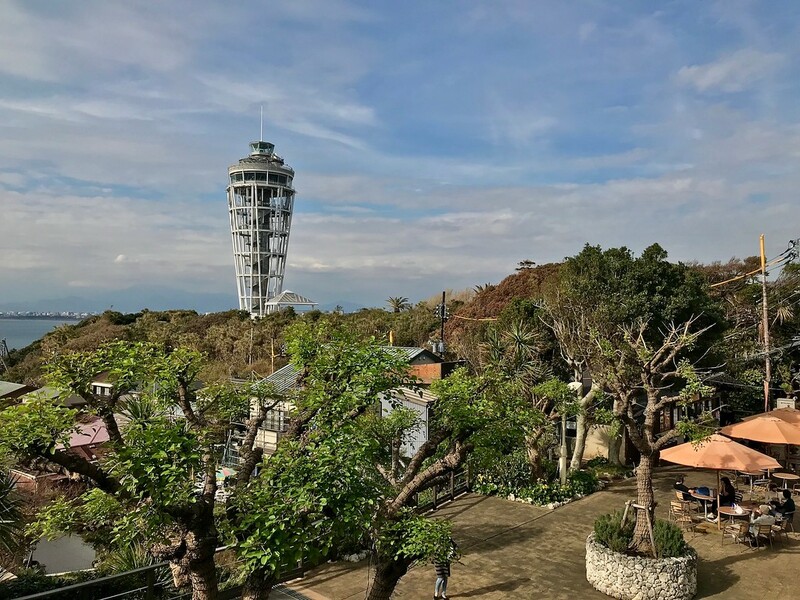 The observation tower on Enoshima is located inside the garden. 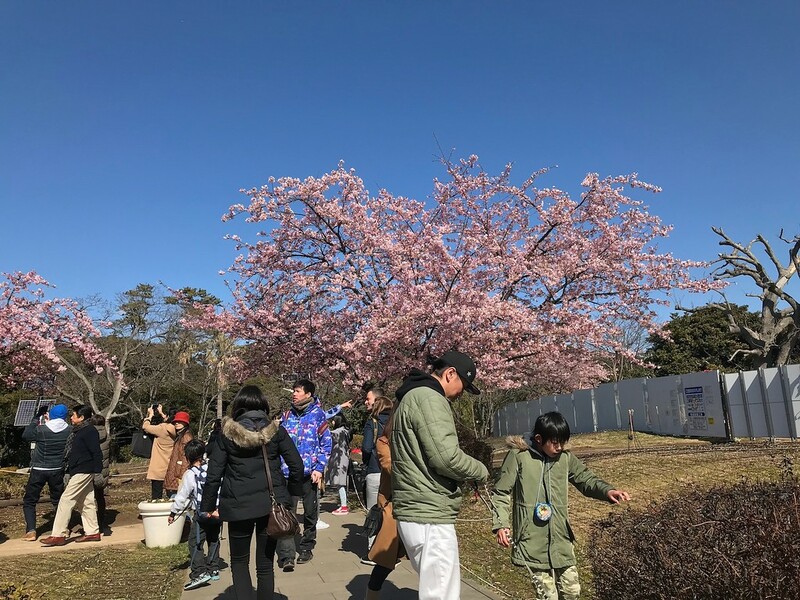 Around mid-February, the Kawazu cherry blossom trees around the lookout points to the left are usually in full bloom. It's a bit chilly, but it's a nice time to visit the island as well. Head up and left to the viewpoints. Give yourself a little time to enjoy the view of the island. 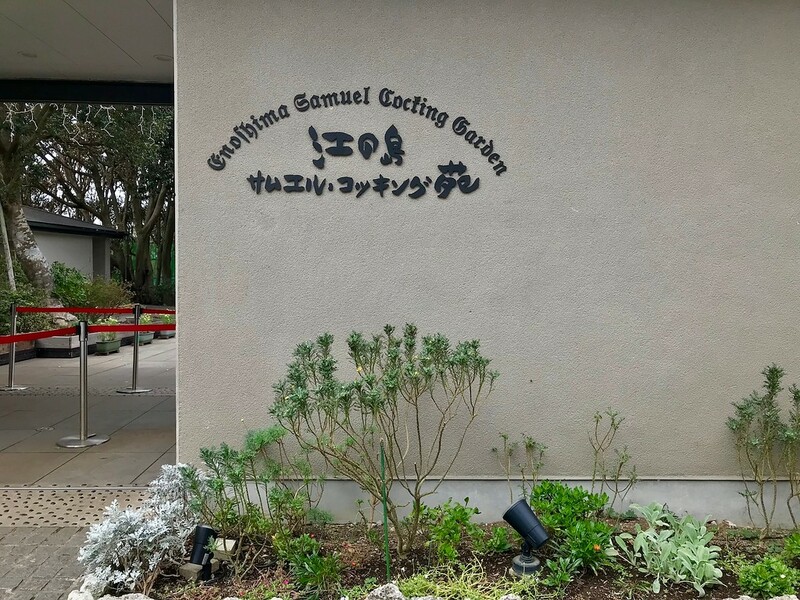 Entrance to the Samuel Cocking Garden is only JPY200. If you are the sort of person who likes panoramic views from tall buildings, you may wish to buy a dual ticket costing JPY500 that will give you access to the observatory deck. 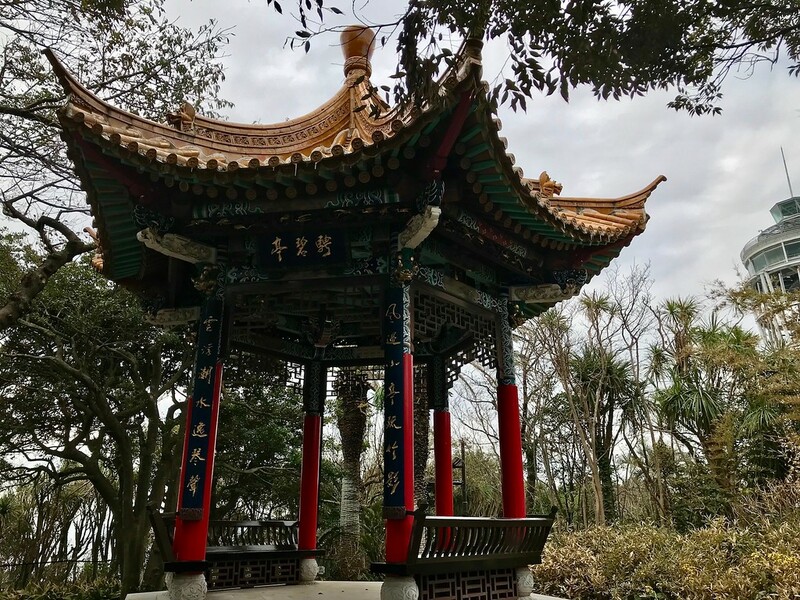 The pavilion was donated by Kunming City in China, which is the sister city to nearby Fujisawa City in Kanagawa. It's a good place to sit and read. Late spring would be a particularly good time to visit the garden. Most of the bushes and shorter trees you see here are varieties of camellia. There were one or two flowers out in November - no doubt confused by the unseasonably warm weather - but otherwise all was green. 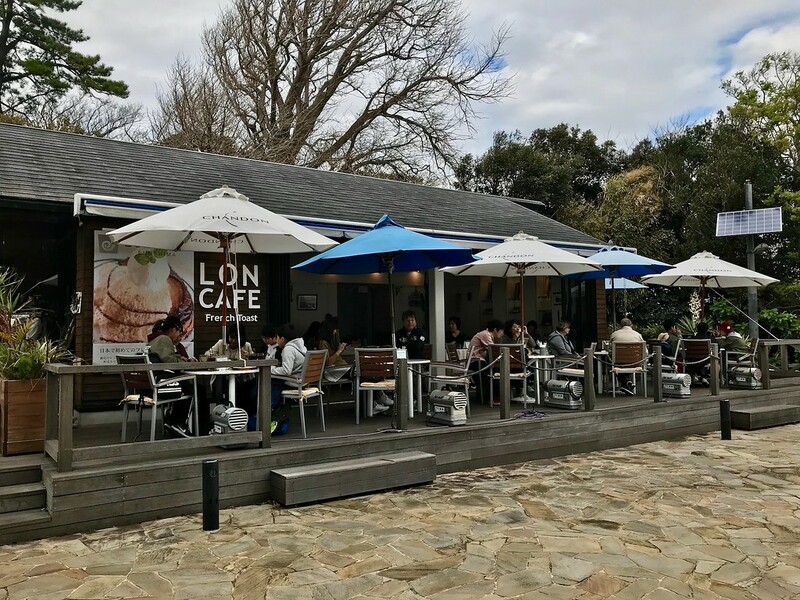 Lon Cafe, located inside the Samuel Cocking Garden, is purportedly Japan's first cafe specialising only in French toast. While this is a very specific claim to fame, we can forgive them this moment of self-aggrandizement, since the French toast is indeed rather good. 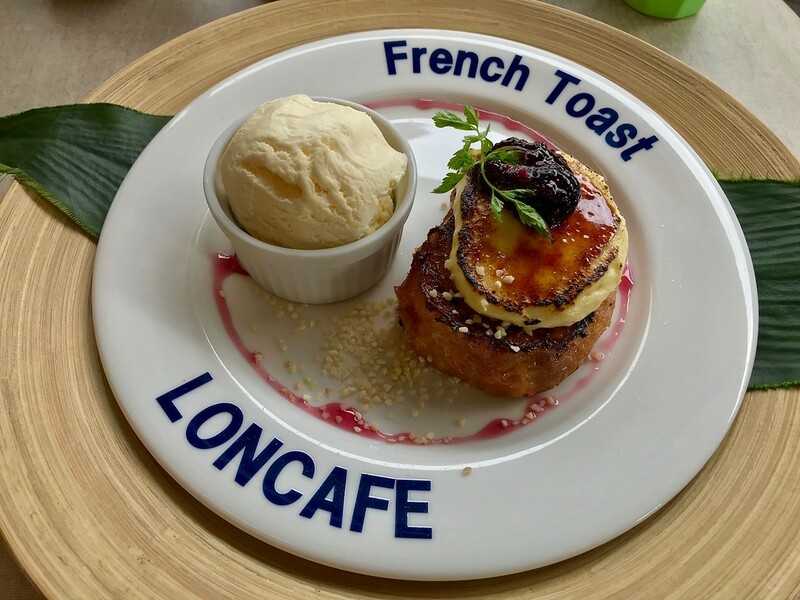 Their best-selling creme brûlée French toast is as rich and custardy as promised. Consider stopping here if you have even the remotest hint of a sweet tooth. There's free (unsecured) WiFi here, which will be a boon (or curse) for some of us. 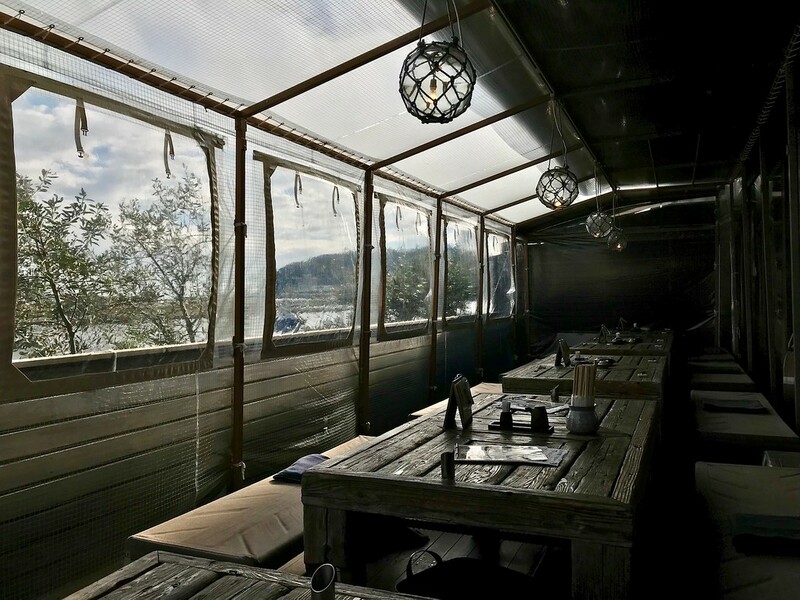 During the colder months, there's an electric heating element attached to the underside of some of the tables, and customers on the terrace will have blankets to cover their legs. They're thoughtful touches that allow customers to linger more comfortably than might otherwise be the case. Incidentally, Lon Cafe looks out onto the sea and a beach in the distance. 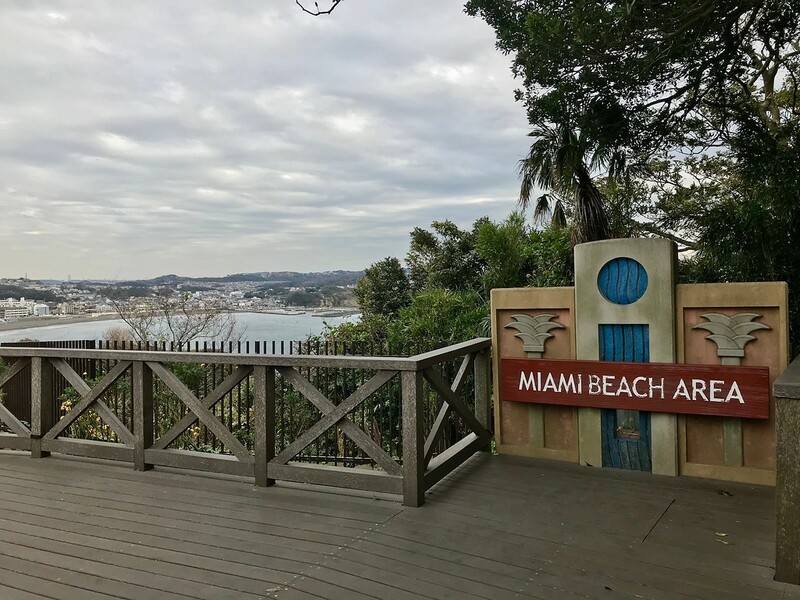 The viewing platform is rather optimistically named ‘Miami Beach Area. 'The beaches around this area are nice, but Miami it is not. After exiting the Samuel Cocking Garden, turn right, and right again. Follow the staircase-lined path. 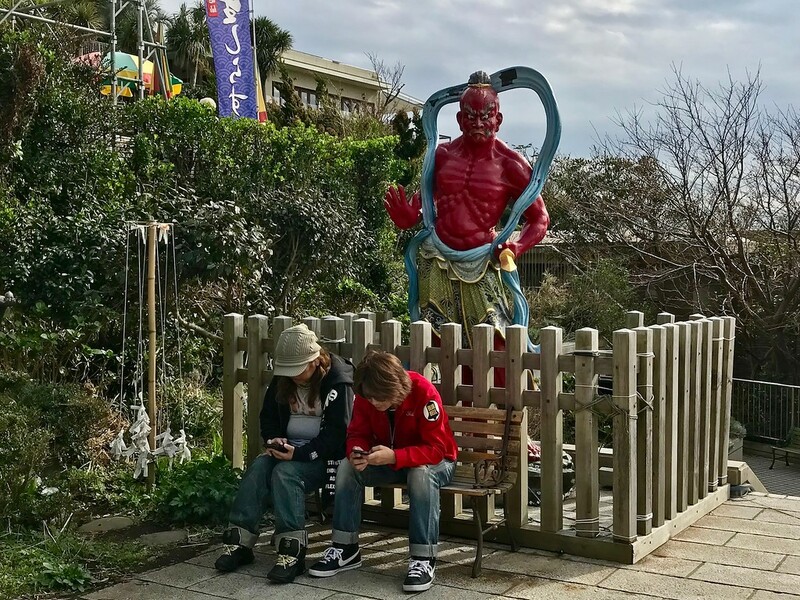 On your left after a few metres, you'll see two red statues at the entrance to a Buddhist temple. 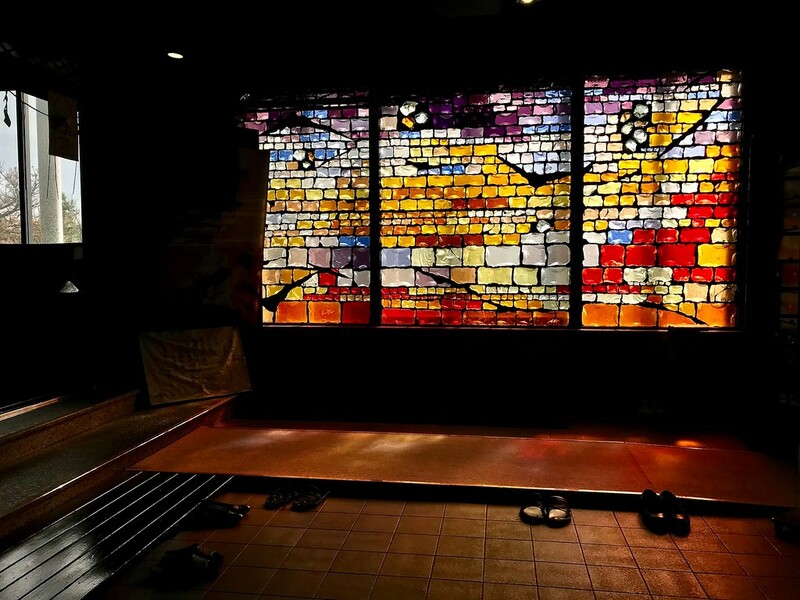 It's worth a quick visit to look at the stained glass wall inside. If you want to enter the main hall, you'll have to remove your shoes. Exit Enoshima Taishi, turn left, and continue down on the path. 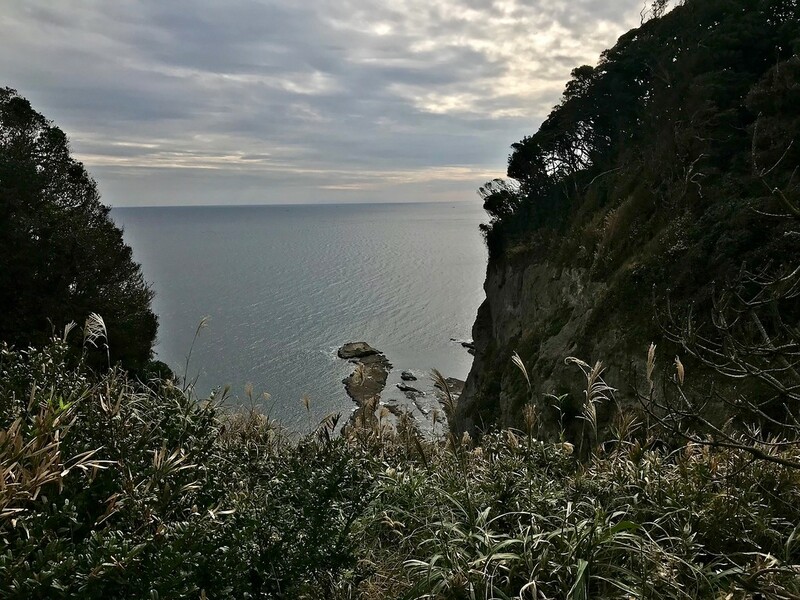 En route, you'll see the Yama Futatsu lookout point, a boundary dividing Enoshima Island in two. 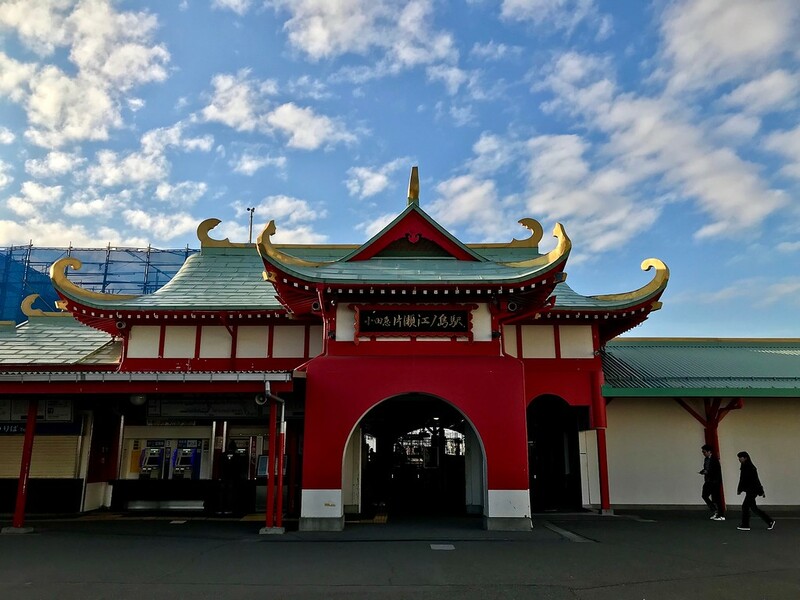 You'll see quite a few restaurants on the way to the Inner Shrine, and it's a good time to fortify yourself. 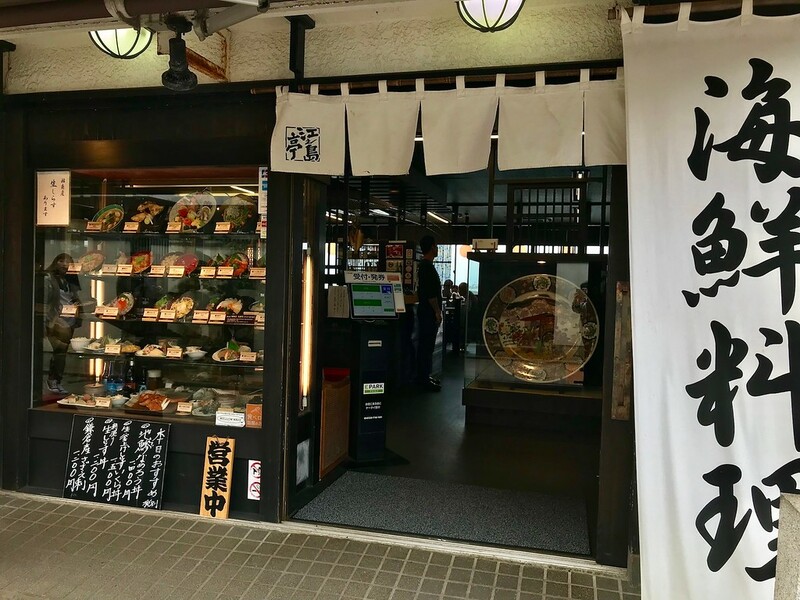 Most of them serve similar rice bowls containing fresh sashimi and either raw or boiled shirasu, locally-caught whitebait. 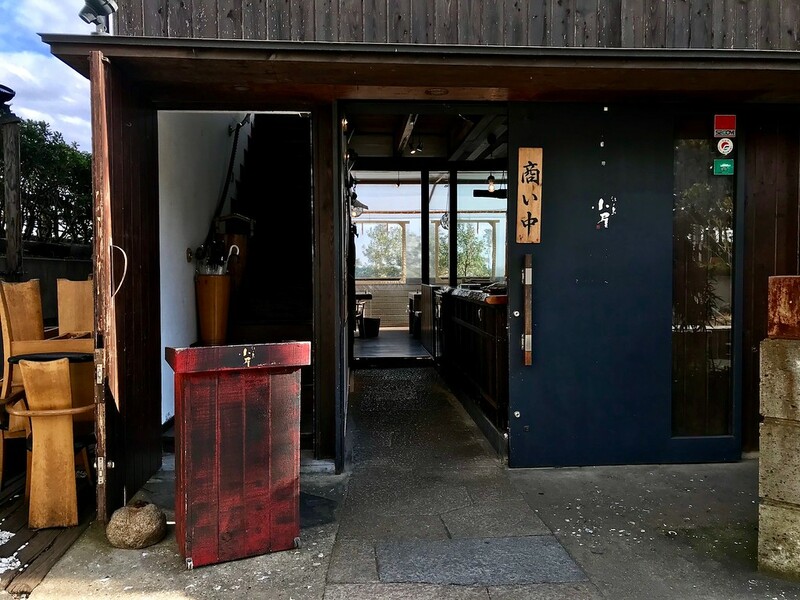 One of the better restaurants on the island for these dishes is Enoshima-tei. 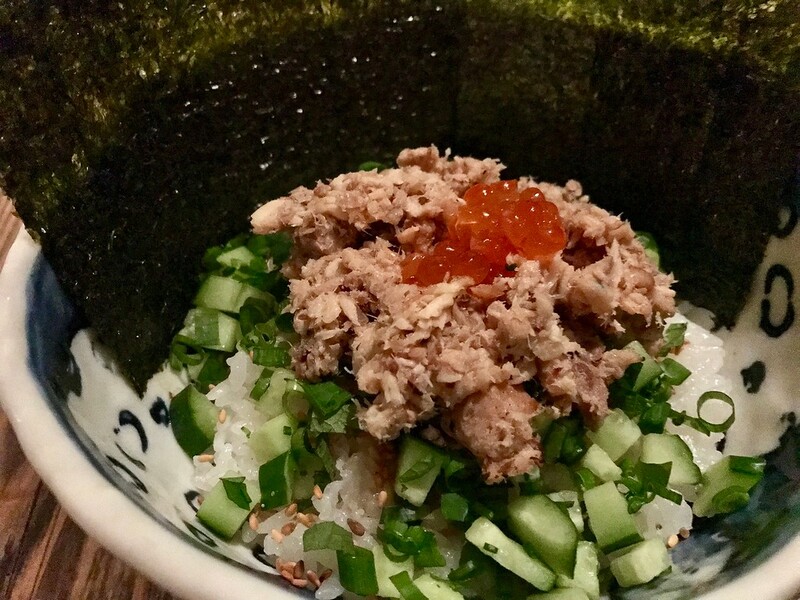 They serve all kinds of variations on raw and cooked seafood rice bowls. 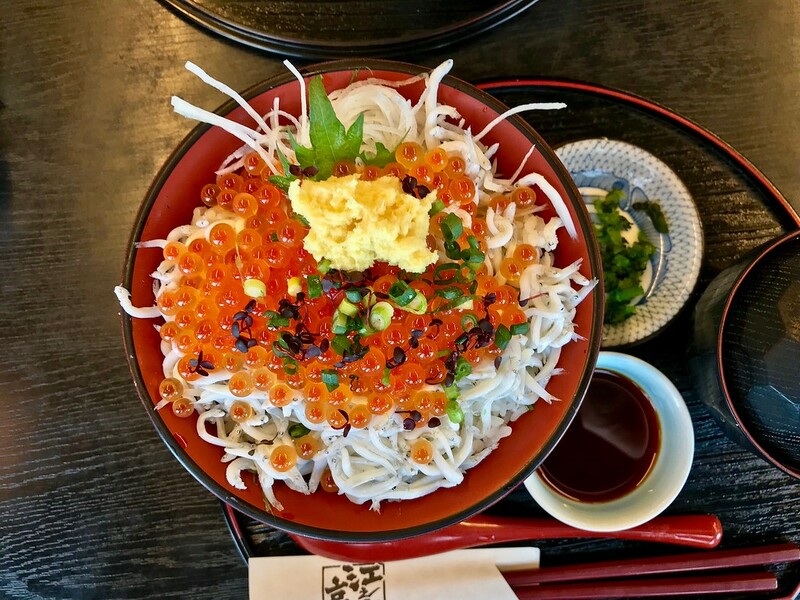 Try the ikura-shirasu rice bowl - a layer of rice blanketed in boiled whitebait and heaps of salty salmon roe. For those less inclined towards seafood or rice bowls, Cafe Madu is a decent alternative. It's a stylish cafe just a few seconds walk after Enoshima-tei. 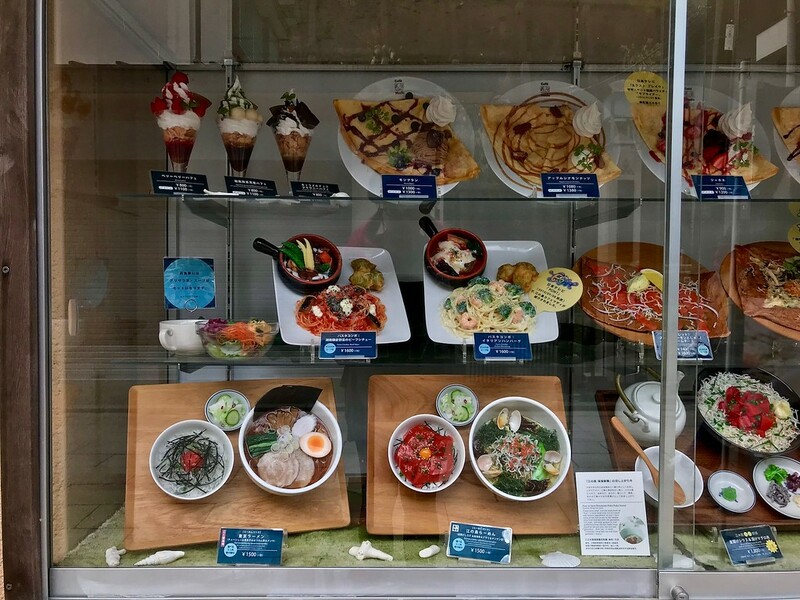 In addition to the rice bowls, they have savoury crepes, curry rice, and ramen on the menu, to name just a few items. After lunch, keep following the path past a few tourist-oriented shops. You'll arrive at the Inner Shrine. 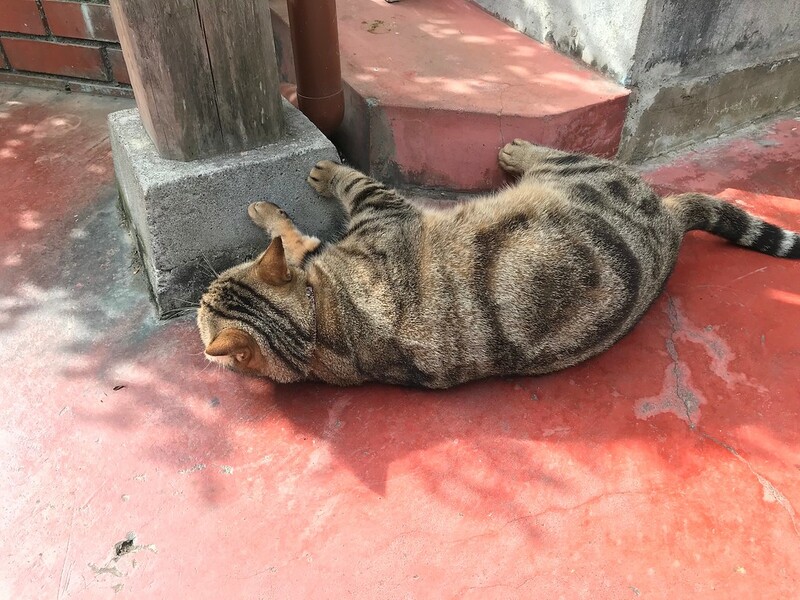 There are usually a few fat cats hanging around this area. Beyond the shrine building on the path to your left is a staircase leading upwards. This leads to the Ryuren Love Bell - which you could visit now, but we'll save it for the journey back this way. 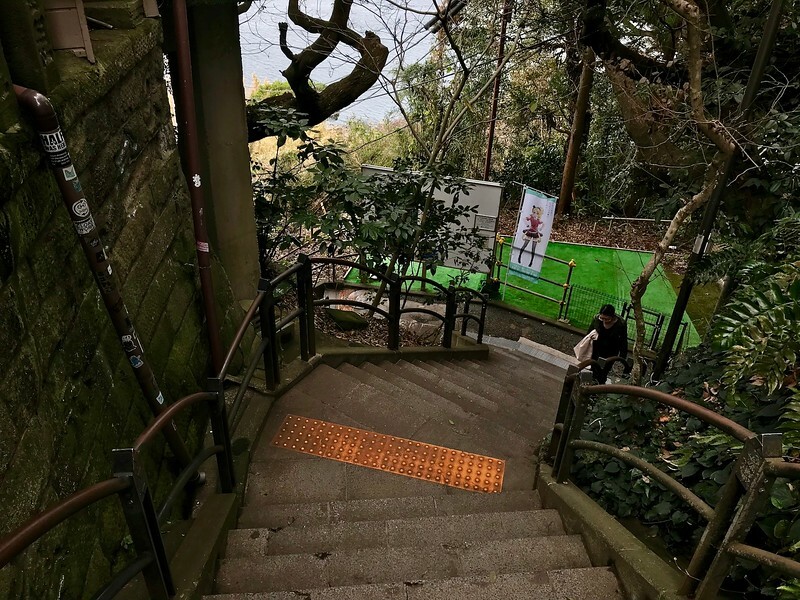 More steep, winding staircases will bring you to the other end of Enoshima Island, where the Chigogafuchi plateau and Iwaya caves are located. 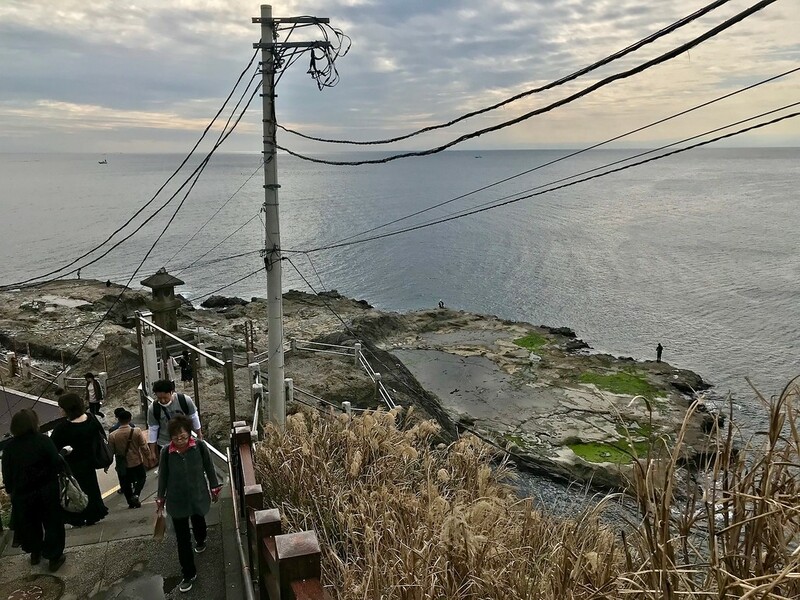 Associated with a tragic ‘double-suicide' love story, this is considered one of the most romantic scenic views in Kanagawa. 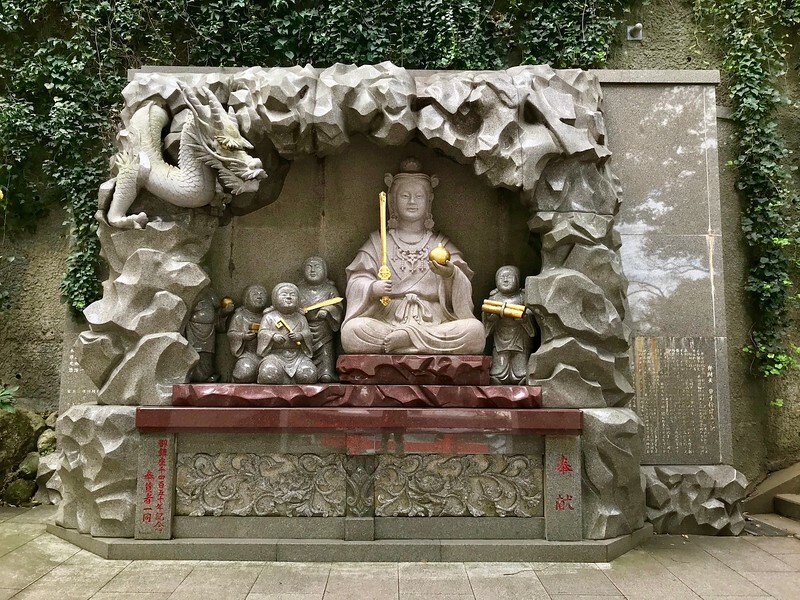 If you like dark places with statues in them, visit the Iwaya Caves. Entry is JPY500, and exploring will take approximately 20 minutes. 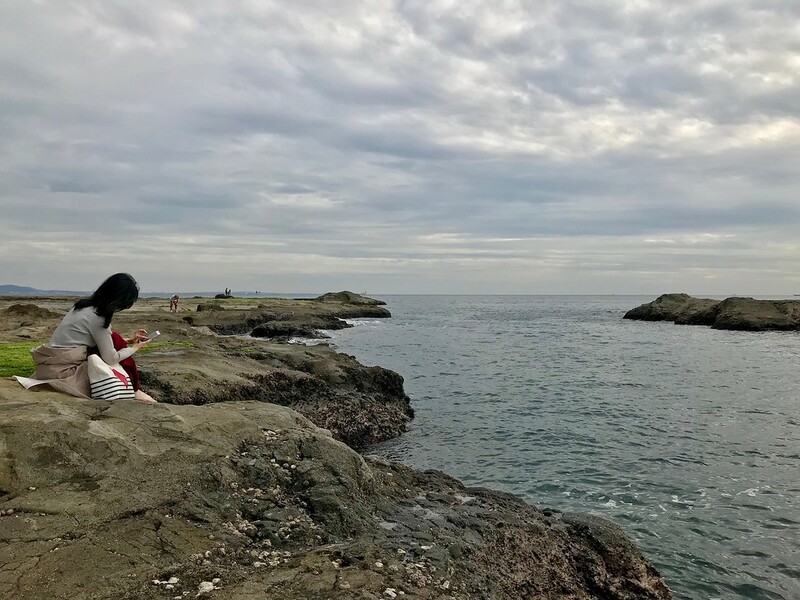 Chigogafuchi plateau is a great place to hang out and look at the sea. You'll see people fishing. Sit on the rocks, watch the waves lap at the rocks, and empty your mind. Climb back up the stairs in the direction you came in. Keep going until you reach the Inner Shrine again. It's time to explore the path left untrodden earlier when you were walking towards the caves. 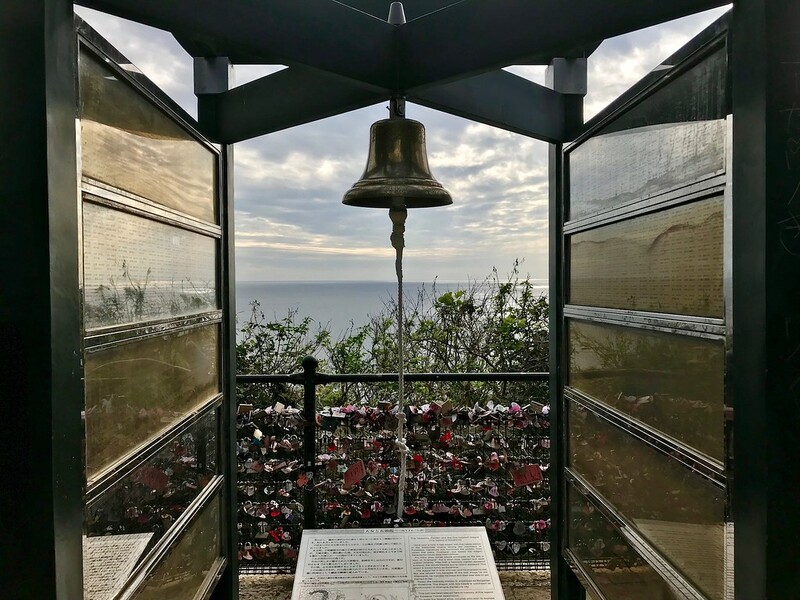 Climb up the gently inclining stairs and follow the dirt path to the bell. 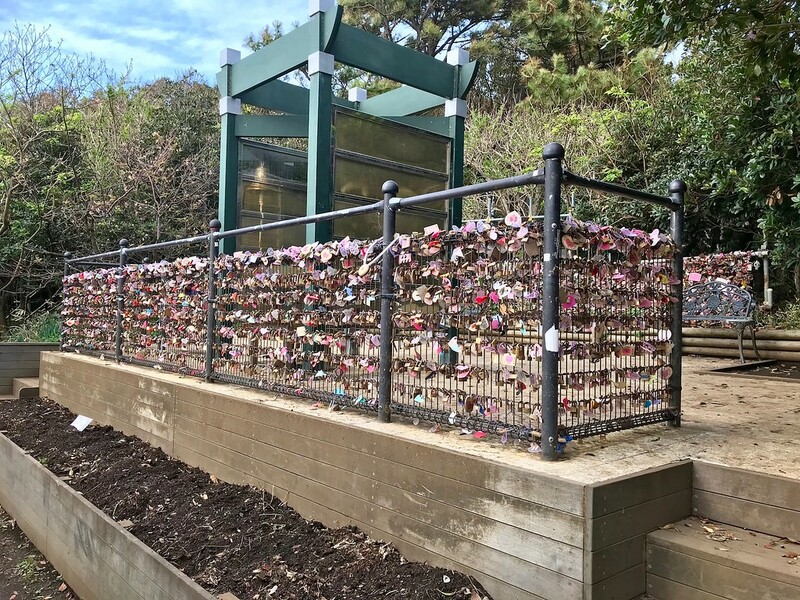 You'll encounter a wooden platform with railings covered in padlocks, like the Pont des Arts bridge over the Seine in Paris. 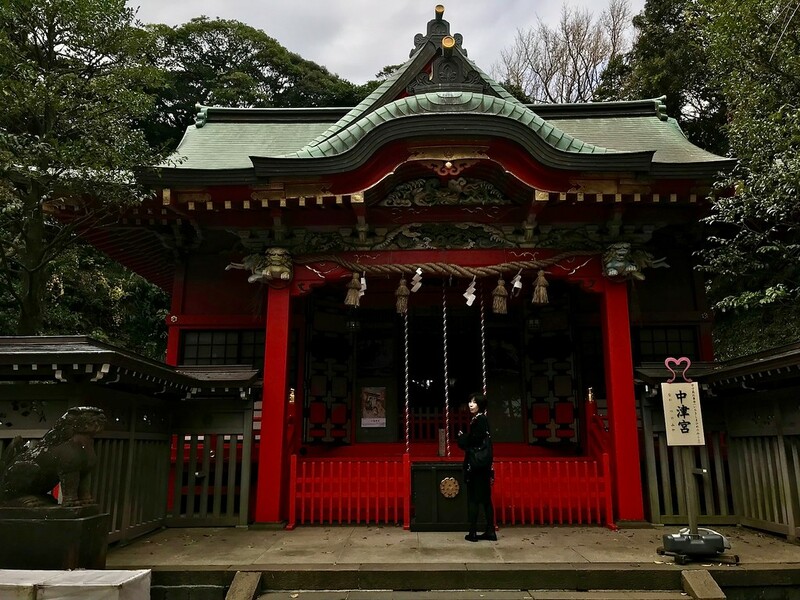 Supposedly, ringing the bell will bring you good luck in love. Nearby is a little clearing to sit and eat or read. You should pretty much done exploring the island at this point, so it's time to head back to the mainland. Retrace your steps and return the way you came. Luckily, it's mostly downhill. Pick up any souvenirs and snacks you missed on your first climb up. Take the underpass that led you to the island. You'll emerge in front of First Kitchen. There's a street leading straight ahead of you - follow it. Along the way, you'll see many charming little boutiques, cafes, ice cream stands, and even an antique shop or two. Take your time exploring and browsing. 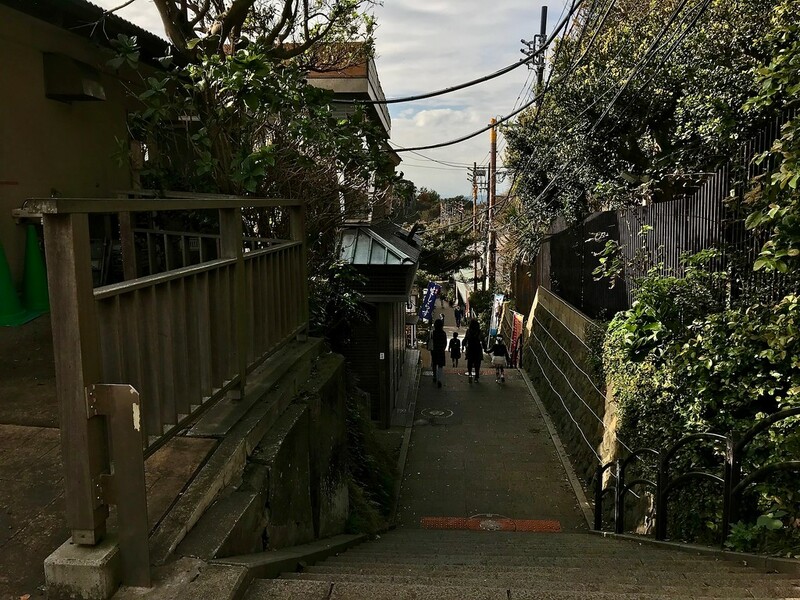 Walking straight down for about 10 minutes will take you to Enoshima Station on the Enoden. This is a tram line that will take you to Kamakura Station. 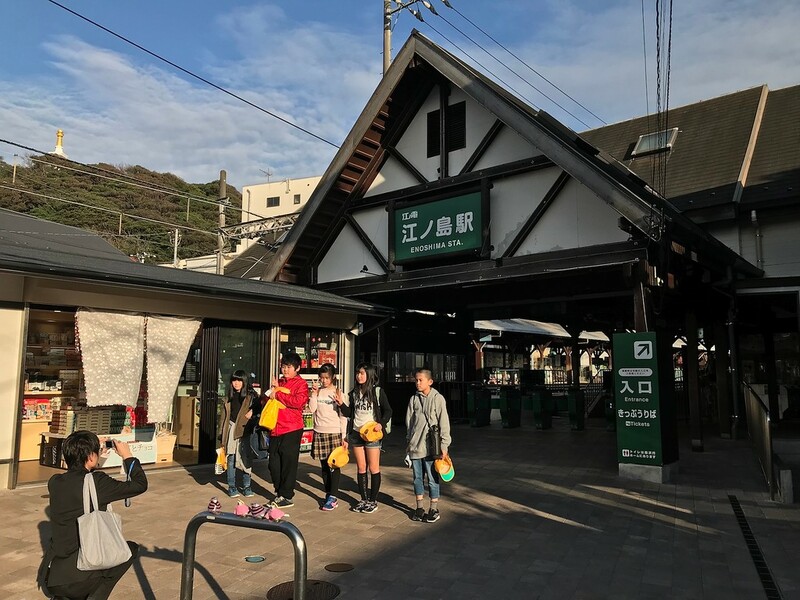 If you started earlier and finished exploring the island quite quickly, it might be worth taking the Enoden a few stops over to Shichirigahama Station, in the direction of Kamakura Station. Shichirigahama Beach is a popular place to watch the sunset; we've marked this on the Google map. 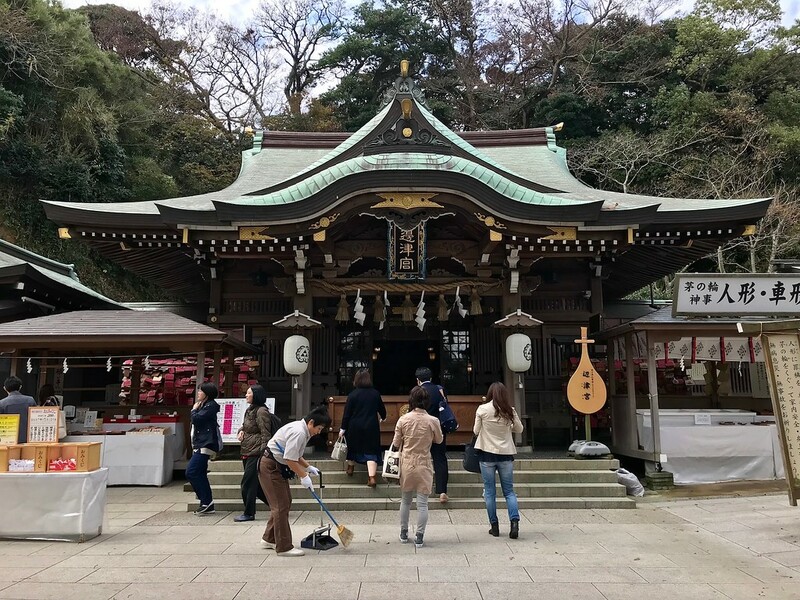 If you're going at a very fast pace, You could even combine a day trip out to Kamakura along with Enoshima Island if you start your day early enough. Since you've come all the way out here, it might be a waste to just go straight back to Tokyo. Enjoying the evening light and staying for the sunset isn't a bad option. Afterwards, if you need dinner, Koya is a cozy little seafood restaurant near Katase-Enoshima station that's great for an evening meal. Lunchtime here sees rice bowl sets; while you'll be ordering a la carte dishes at dinner time by candlelight. When coming from the island, head back towards the underpass that took you here. Instead of entering the underpass, turn left and cross the bridge. After crossing the bridge, you'll see a staircase to your left. Head down the staircase. Koya is on your left. What's good here? Most dishes are, but since you're in Japan, the one thing you should finish with is a rice bowl. The Horohoro-don, with chunks of fish and salmon roe, drizzled with soy sauce and butter, is a nice, hearty shime (end) to the meal. Exit Koya and turn right, walking up the staircase. Cross the road at the traffic lights. 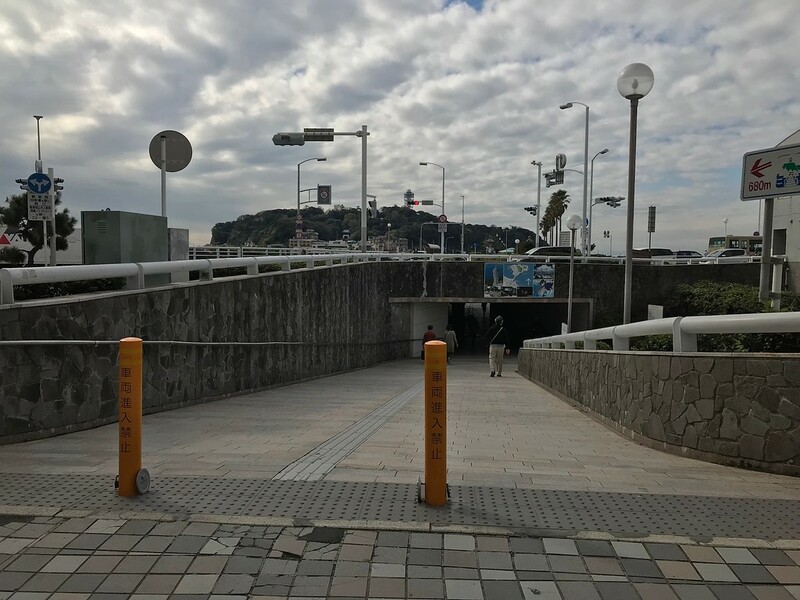 Take the first street to your left, which leads you back to Katase-Enoshima Station. Here, you'll take the local line towards Sagami-Ono Station. Alight at Fujisawa Station and walk to Platform 1 or 2, taking the next Rapid or Rapid Express train bound for Shinjuku Station. 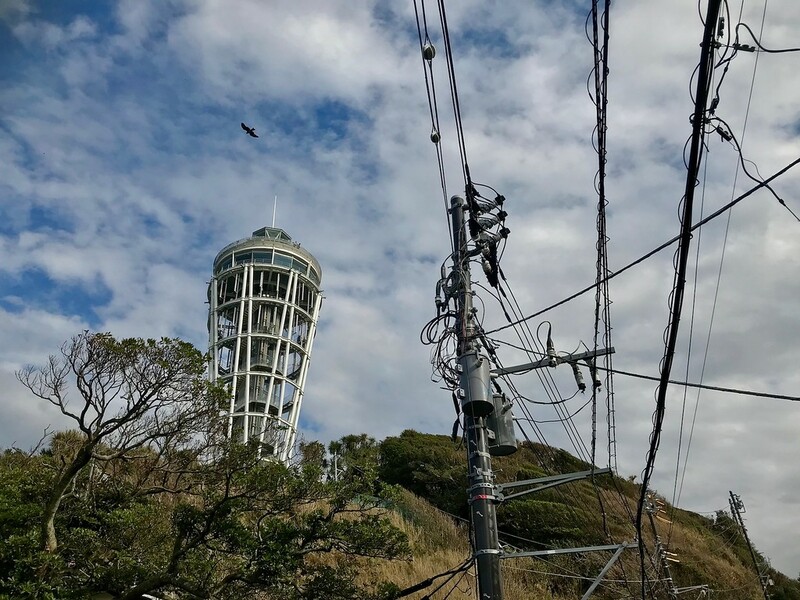 Although Enoshima Island is an easy day trip from Tokyo, you might want to slow down and spend a night there. This will give you a break from the city and allow you to explore the area in more depth. Here are some recommended accommodations. 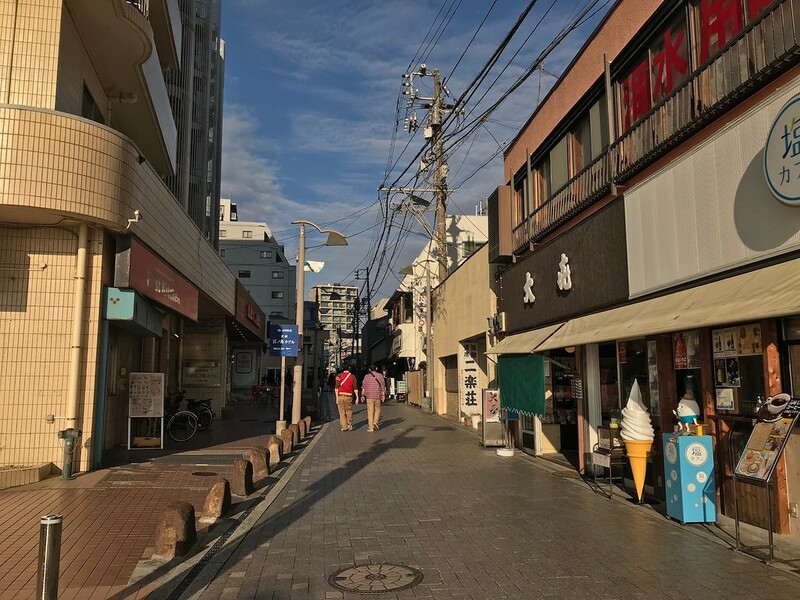 A hop and a skip away from Katase-Enoshima Station, this understated, traditional Japanese inn is conveniently located for guests who want to stay near Enoshima Island and the beach nearby, but also have easy access to the Enoden and Odakyu train lines for travel to Kamakura. Breakfast is included on request, and there are flat-screen televisions in each room. Located 2 minutes away from the beach, Katase Enoshima Hotel features rooms with a blend of Japanese-Western design elements - tatami floors with Western-style beds. All rooms are ensuite and equipped with air-conditioning - a blessing during the summers. 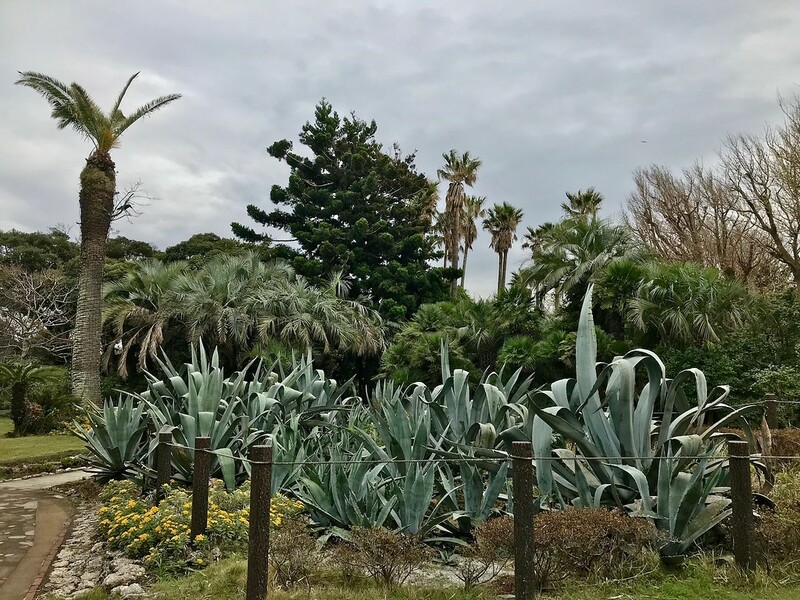 It's located along the main shopping street near Katase-Enoshima Station, making it easy to walk out to Enoshima Island. 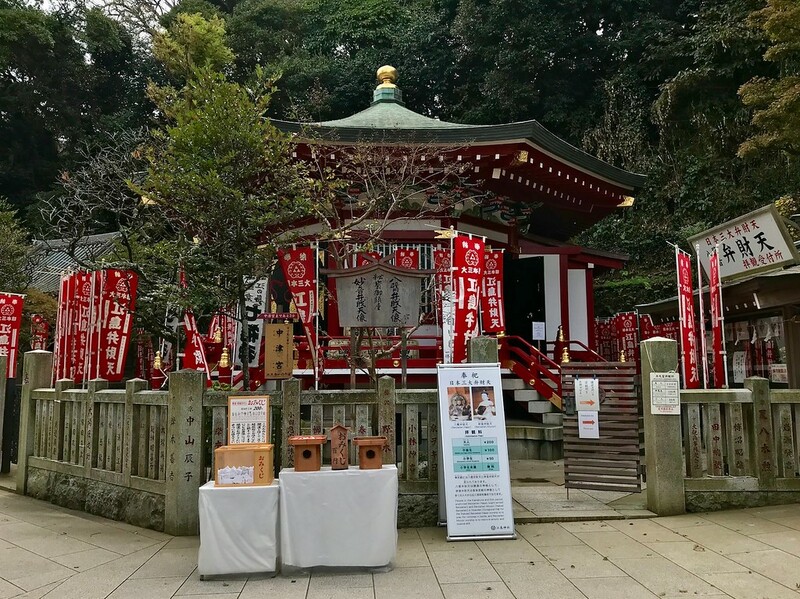 The Enoden is also within walking distance for day trips to Kamakura. 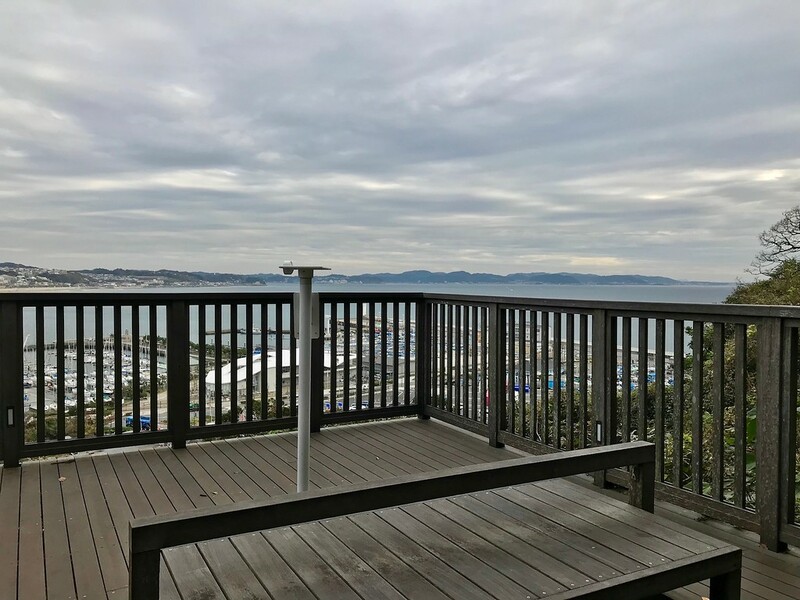 This charming, friendly guesthouse is a minute away from Katase-Enoshima Station and around 4 minutes on foot from the beach. Bathrooms are shared, but all rooms are air-conditioned. Rooms and dormitories are equipped with mosquito nets. Guests can hang out in the lounge or play table tennis together. Bicycle rental services are also available. 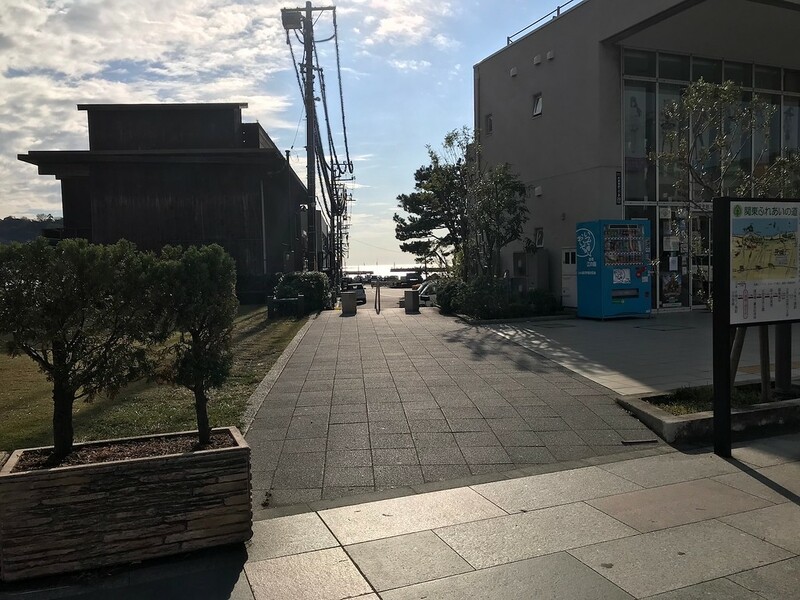 This hotel is located at Shichirigahama Beach, a few stops down from Enoshima Station on the Enoden line. It’s just far enough from the tourist hotspots but close enough that they’re very accessible. The hotel rooms are brightly lit, with floor-to-ceiling windows; some have panoramic ocean views, making for beautiful sunsets from your bed. Highly recommended for those looking for somewhere comfortable and a little special. 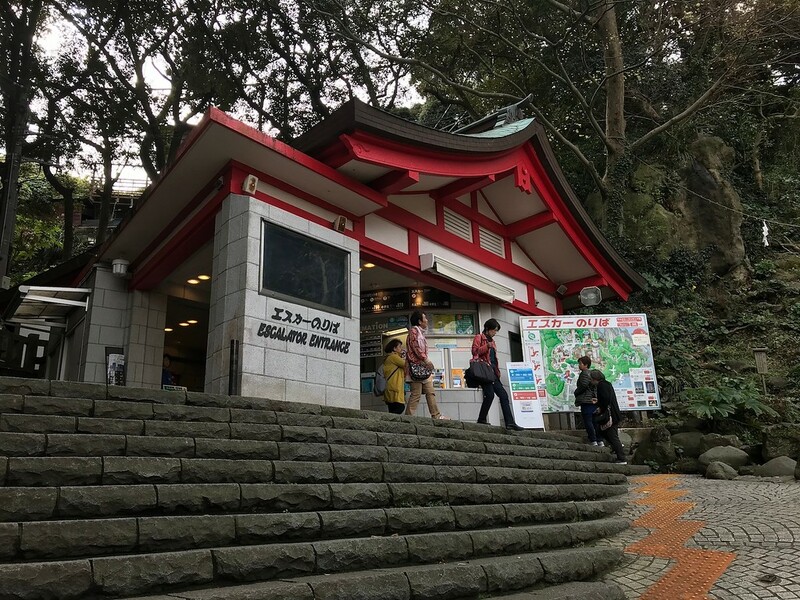 While it's closer to Kamakura than it is to Enoshima, a few stops on the Enoden will take you here after a day out on the island. This is a European-style hotel located 5 minutes away from the beach on foot. Both Japanese and Western-style rooms with stunning ocean views are available at this hotel. A spa is also available on-site for guests who just want to relax. 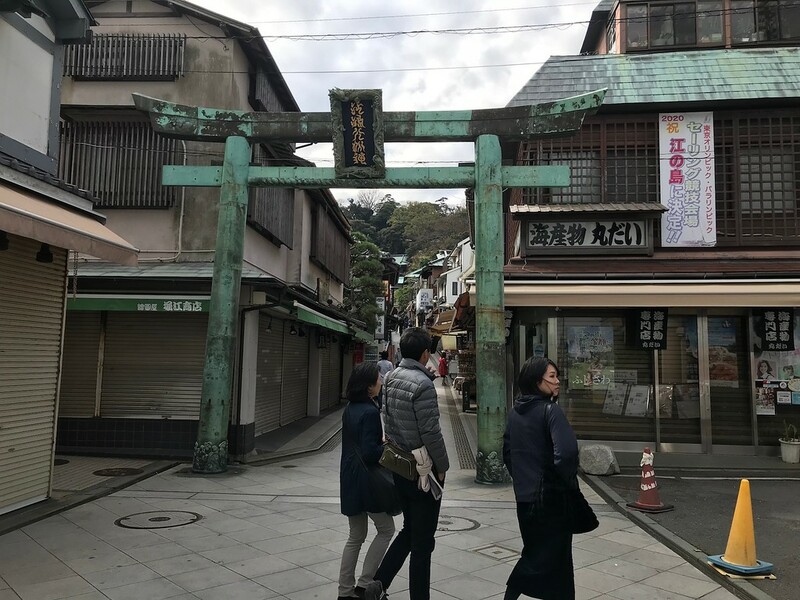 Major temples and stations - Hasedera Temple and Hase Station, for instance - are located within 10-12 minutes walking distance from the hotel. They also offer bicycle and car rental services. If you are checking out but exploring for the day, the 24-hour front desk also offers luggage storage.